Cuomo didn’t indicate in his Wednesday op-ed how much he hopes to raise the wages by, but he did mention his past attempts to increase the minimum wage before they were stymied by New York State lawmakers. “In 2013, I raised New York State’s minimum wage; it is now $8.75, up from $7.25 (and will rise to $9 at the end of the year). In my latest budget, I proposed raising it again, to $11.50 in New York City and $10.50 elsewhere in the state. But the Legislature rejected that proposal. So I am continuing the fight. While lawmakers delay, I am taking action,” Cuomo wrote. Cuomo has the authority under state law to direct the labor commission to study wages in a particular industry or job classification, something he said he would do on Thursday. The governor expects a recommendation from the panel in about three months. Cuomo said the income gap is most extreme in the fast food industry, where CEOs are among the highest-paid corporate executives. The “average fast food CEO made $23.8 million in 2013 … entry-level food service workers in New York State earns, on average, $16,920 per year,”Cuomo wrote. There are about 180,000 fast food workers in the state and more than one-third of them work in New York City. Cuomo said fast food workers and their families are twice as likely to receive public assistance compared to other workers, and the state ranks first in public assistance spending per fast food worker, at $6,800 a year. The governor’s announcement was met by criticism from business groups concerned he was going around the state legislature, which usually sets wage policy. Ahead of a wage strike at fast food outlets on April 15, McDonald’sannouncedit was raising the minimum wage to $9 an hour, but only at the 1,500 corporate-owned restaurants. This would affect 90,000 workers, leaving 90 percent of workers at more than 14,000 franchises without a wage increase. 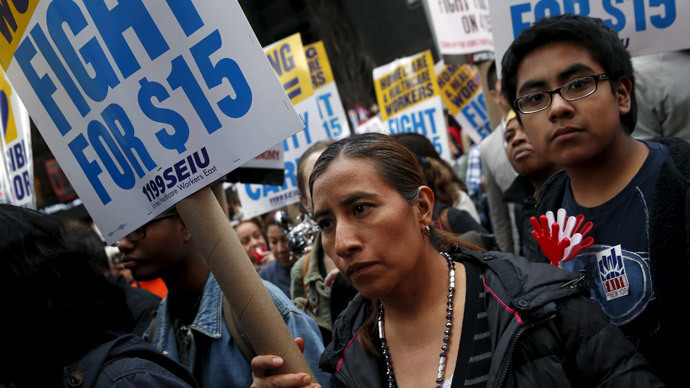 These announcements have followed several years of action by the Fast Food Workers Campaign, backed by the Service Employees International Union, which has orchestrated protests across the country demanding workers be paid $15 an hour.